This Thursday is World Book Day which is a celebration of books. 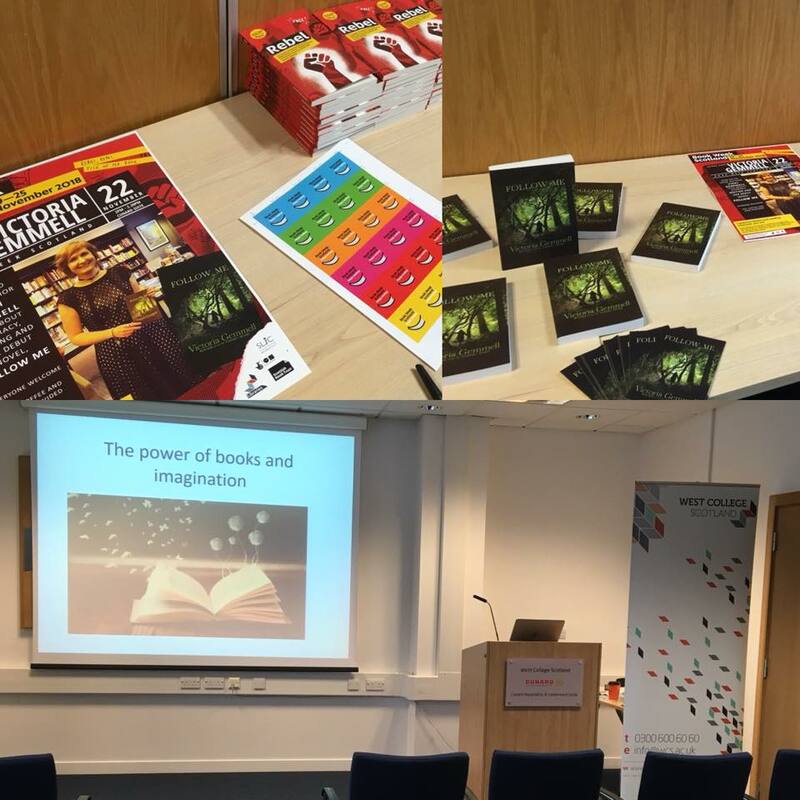 Authors are often asked to get involved in events to share their love of reading and writing. 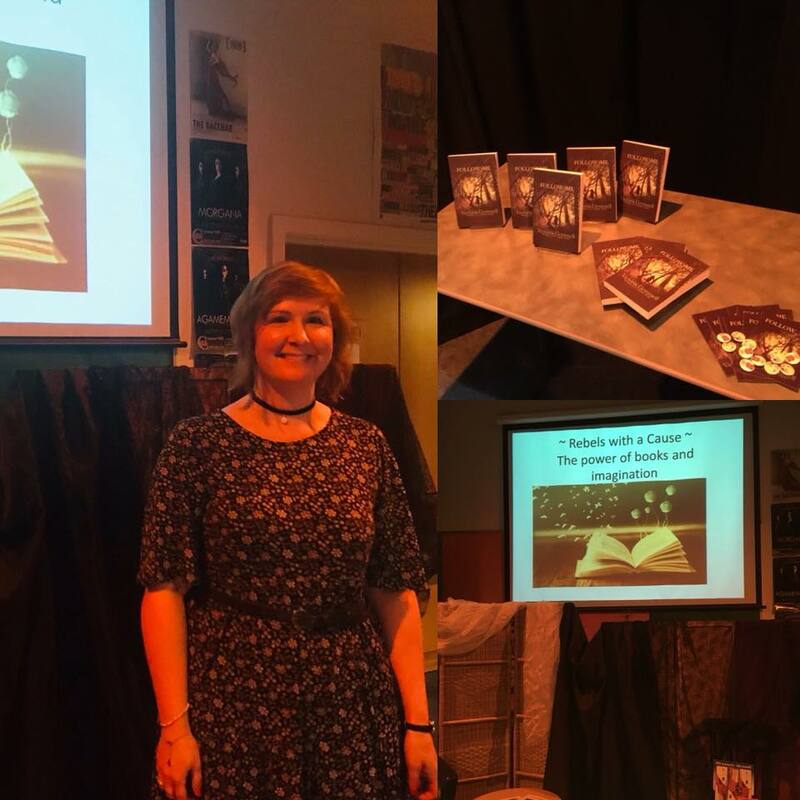 This year I’m going to be visiting Crossreach school where I’ll be talking to the pupils about storytelling and how anyone can build a story using their imagination. If you’re anywhere near Glasgow pop in and say hello. I will answer any questions budding writers and enthusiastic readers may have! Nearer the end of the month I’m going to the Scottish Association of Writers conference. 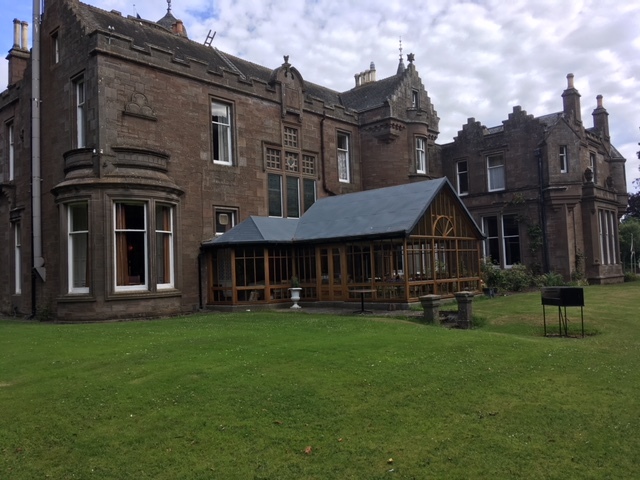 I love going here as it’s a weekend of workshops, catching up with writer friends and eating LOTS of great food in a great hotel! This year I’ve also taken a couple of days off work, (my day job), when I return so that I can immerse myself in writing for that little bit longer. My days ‘off’ will be spent working on book 3. I’m enjoying writing this one and want to try and get my first draft finished over the next few months. (Then there will be lots of edits of course!). People often ask me how long it takes to write a book. Too long, I usually want to say, because really if I could, I would love to sit and write 5,000 words every day but I rarely have the brain energy to do this after a busy day at work. I’ll often do light edits and set myself up for a good session when I have a bigger chunk of uninterrupted time. If I set aside a day for writing I have learned to be very disciplined about it and treat it like a proper work day, but really it’s more fun than a work day. There’s nothing more blissful than switching off from the ‘real world’ for a few days and switching on some music and getting lost in the worlds I create. (I’m currently listening to Chvrches, who are a Glasgow band. I saw them live for the first time the other weekend and it was a brilliant gig!!). I’m hoping to also share proper news of book 2 VERY SOON. Bye for now. Happy 2019! 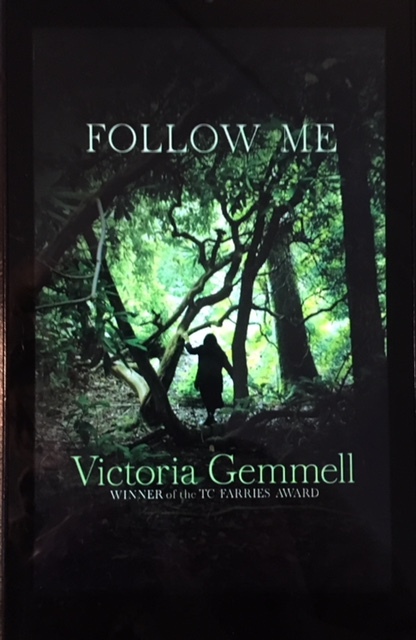 This weekend I was delighted to see the ebook version of Follow Me has been released by my publisher, Strident. You can download it by clicking here The fabulous cover, designed by the talented Ida Henrich, looks very vibrant on Kindle Fire! It has been a few years since the launch of the paperback. I know a lot of people who read this blog already have their signed paperback copy (thank you!) but for new readers I thought I’d take this opportunity to tell you a bit more about Follow Me and the inspiration behind it, by re-posting extracts from a couple of blogs I featured on around launch time. What is the deadly allure of The Barn? 17-year-old Kat Sullivan has been devastated by the recent death of her twin sister, Abby, the fifth apparent teenage suicide victim in a year in the town of Eddison. Kat begins a desperate search for an explanation and soon realises how little she knew about her sister’s life. Through Abby’s friends Kat is introduced to an underground hangout called the Barn. Here, Kat meets the enigmatic Rob and his friend, Michael, art students who have re-created the infamous pop artist Andy Warhol’s ‘Factory’; a place where creative types can construct art and socialise. Kat gets drawn into Rob’s social scene, initially enjoying the freedom and escape that comes with the Barn’s creativity and nonconformity. She is seduced by the attention of this very attractive stranger, but soon begins to realise that Rob holds a strange influence over the young people – particularly the females – while Michael has a fascination with famous actors and icons who committed suicide or died young. Can Kat trust them to help her find the answers she needs, or will they lead her deeper into a world from which she won’t be able to escape? Fiona: (Author interviews) What inspired you to write your first book? A couple of things sparked off the ideas for Follow Me. After reading a lot about the Pop Artist Andy Warhol, and his infamous artist studio, The Factory, I began to think how appealing an underground creative hangout might be for teenagers in a town where not a lot is happening – this fed into the creation of The Barn within my book. Newspaper stories from years ago had stayed in my head, about a large number of teenage suicides in a small town and the writer in me kept thinking, What if something more sinister was happening there and no one bothered to figure it out? 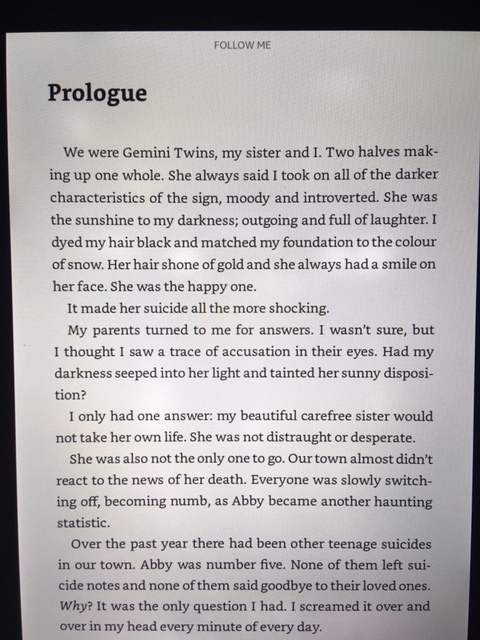 That’s what sparked off the idea for the mystery element in my book; my protagonist, Kat, is trying to figure out what has really happened to her twin, Abby, refusing to believe she would take her own life. I don’t want to spell out all the messages as I think it will be more fun for readers to figure it all out… It explores a few themes: society’s fascination with celebrities, the sense of isolation and loneliness you can feel as a teenager, the allure of wanting to be part of something new and different. WHAT REALLY HAPPENED IN THE WOODS? Rosemary: (Reading and Writing) What attracted you to YA fiction and do you enjoy reading it? 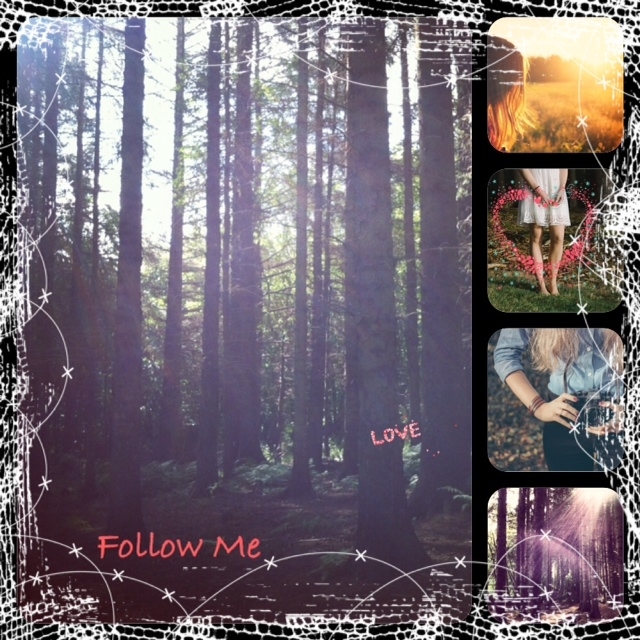 When the story of Follow Me started to form in my head I knew it was going to be a story about teenagers so it fitted into the YA genre, but ultimately I wrote a story which I wanted to read. I love reading YA as I think a lot of these books tend to be driven by character and plot and the authors aren’t afraid to explore emotional and current contemporary issues. I think it’s more recognised now that even if a book is labelled Young Adult, a lot of the time that readership extends way beyond teens, which I hope will be the case with Follow Me. There are a lot of Pop culture references as well as poetry – is this something that particularly interests you? During my undergraduate degree in Communication and Mass Media one of my favourite modules was Popular Culture. 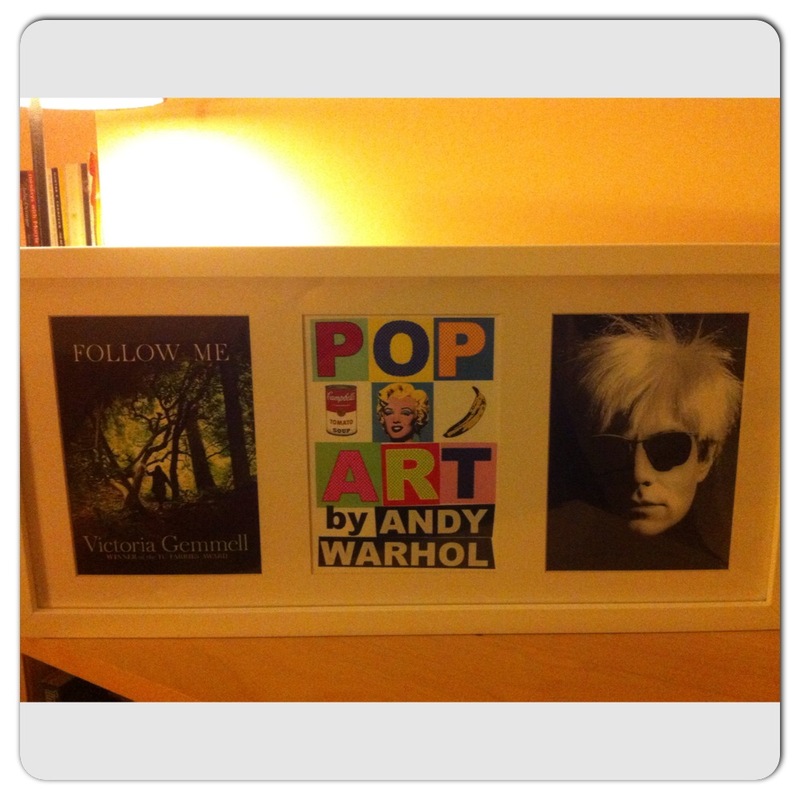 I developed a fascination with Andy Warhol, one of the leading Pop Artists. Warhol was very perceptive about the direction society was heading in, with his art mirroring society’s increasing obsession with fame, celebrities, and ‘the surface image’. These are themes I touch upon in my story. 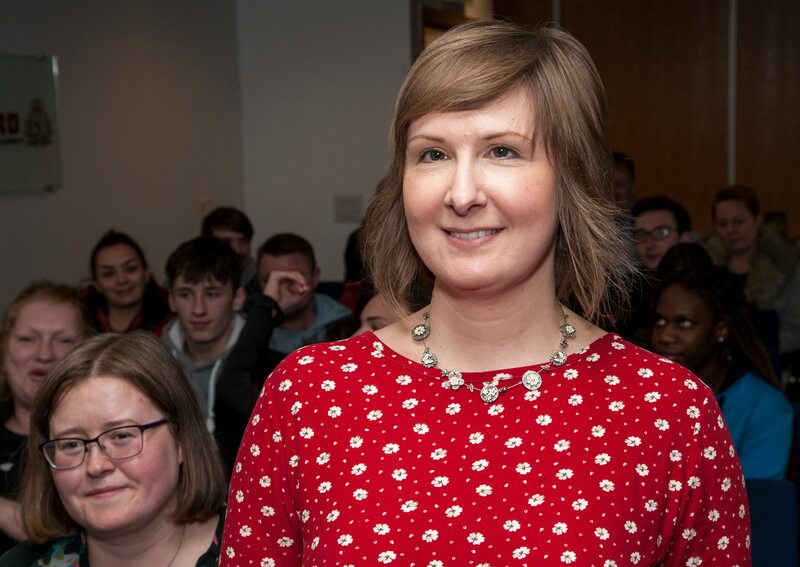 I always enjoyed analysing poems during Higher and Sixth Year Studies English (though focused on more contemporary poets during that time), and grew up surrounded by book cases containing a wide variety of poetry. I liked the idea of incorporating some quotes from poems into the story. Keats’ Ode on a Grecian Urn (quoted in Follow Me), is a brilliant poem, and I like the layers of meaning you can get from it. Why did you make your story about twins? When the plot was developing in my head, my main protagonist, Kat, came to me first, and I knew she was going to be struggling with the unexplained death (an apparent suicide) of someone very close to her. I thought it would be interesting to explore the relationship of twins and the guilt Kat would feel knowing she had distanced herself from Abby, wanting to forge her own identity. It also allowed a couple of instances of mistaken identity and confusing emotions between her and Rob (who knew Abby first). Also Andy Warhol was a big fan of repeating images over and over in his work, to reflect sameness and the loss of originality. I think my subconscious was at work a lot of the time during the creation of this story! Below is an extract from a post I wrote titled ‘Who is Andy Warhol?’ (you can see the full post in my archives here). This gives a bit of a background to the pop culture references and Andy Warhol influences in the story. Warhol’s Factory studio was a magnet for celebrities and misfits – the artist’s workplace transformed into a social meeting place, attracting not only those in the art world, but film stars and other music icons. As the plot for Follow Me began to form in my head I thought about how attractive and appealing an underground hang-out might be for a group of bored teenagers stuck in a small town where not a lot is happening – especially if out-of-town attractive art students were the creators. The Barn within my book offers an escape and holds an allure for the young people, but there is a darker side to the hangout, creating the mystery element of my story. What always struck me was how perceptive Warhol was about the direction society in which was heading, in relation to our obsession with fame and ‘the surface image’. He was credited with the infamous line, that, ‘In the future everyone will be famous for fifteen minutes.’ With the over-saturation of reality TV and the oversharing of our daily lives – through personal photos and video clips on social media channels – it appears that today everyone is indeed having their fifteen minutes of fame. Society’s obsession with image and fascination with celebrities, (a fascination which appears to deepen when they die young, at the height off their fame), sparked off other themes within my novel. Warhol became more than just his art – everyone wanted to know him and be with him. He actively encouraged and embraced this fame and recognition, and also constructed an ‘image’ of himself to portray to the world (donning a wig and sunglasses). Through my studies I became more fascinated with the story behind his art work, and to me he became both an Icon and product of the postmodern world -Warhol himself is the art. For those of you who keep asking when my next YA book is coming out. It is finished. I will post news when I can. Meantime I am focusing on book 3, another dark YA which I am VERY EXCITED ABOUT. As well as attending interesting events I was working on more edits of my second YA book, (which is due for release early next year), as well as writing more of my third YA. I’m quite excited about both of these books! The past few weeks I have been busy working on a different kind of writing project. 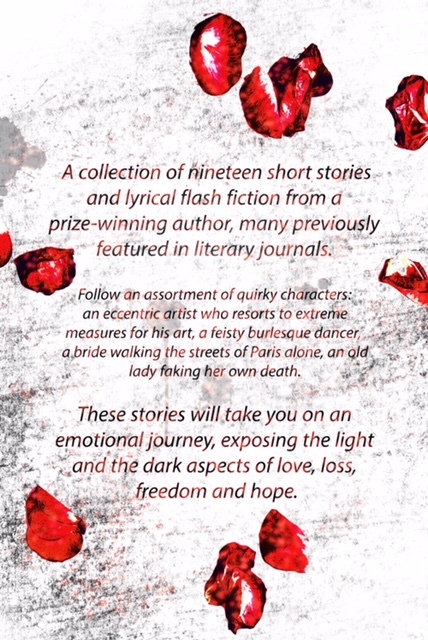 I’m delighted that my collection of contemporary short stories, many of which have been previously published in literary journals or been placed in competitions, is now available on kindle. 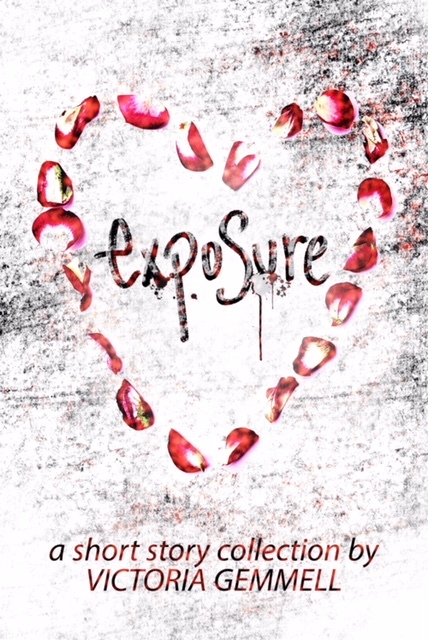 You can buy ‘Exposure’ here. Working on this collection reminded me how much fun I have interchanging between longer novels, and short stories, (sometimes very short stories in flash fiction form). My short stories have more adult themes, and with my flash fiction in particular I enjoy experimenting with more lyrical styles of writing. Working with a shorter form can be just as challenging as novel length as you really need to make every word count. I asked my talented designer friend, Rebecca Johnstone, aka Dainty Dora (see her website here), to design my cover and I couldn’t be happier with the beautiful result! See below. I have to also thank my Mum for supporting with the edits and technical side of production! (see my writer Mum’s website here). 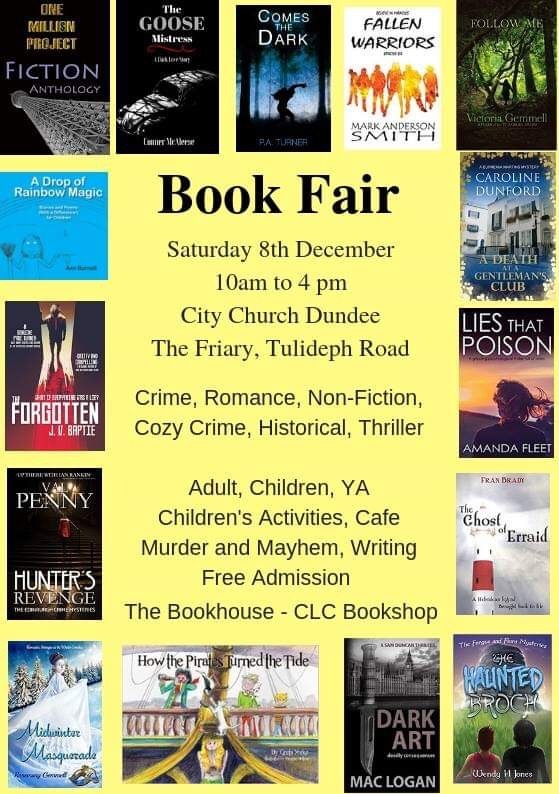 And if that wasn’t exciting enough I’m going to be attending a massive Book Fair in Dundee on Saturday with over 30 other authors. I’ll be selling copies and signing copies of my YA mystery, Follow Me, and will also be running a story-building creative writing session for any visitors who want to use their imagination to delve into new worlds! If you’re in the Dundee area come along. There’s a challenge going around social media just now to post the covers of 7 books you love, with no explanations or reviews, over the course of a week. I was tagged last week by two friends on Twitter and it got me to thinking about the sheer number of books I have loved over the years, but also the ones that have had the biggest impact on me , or influenced my writing. So I decided to break the rules, (because really who likes to be restricted by rules? 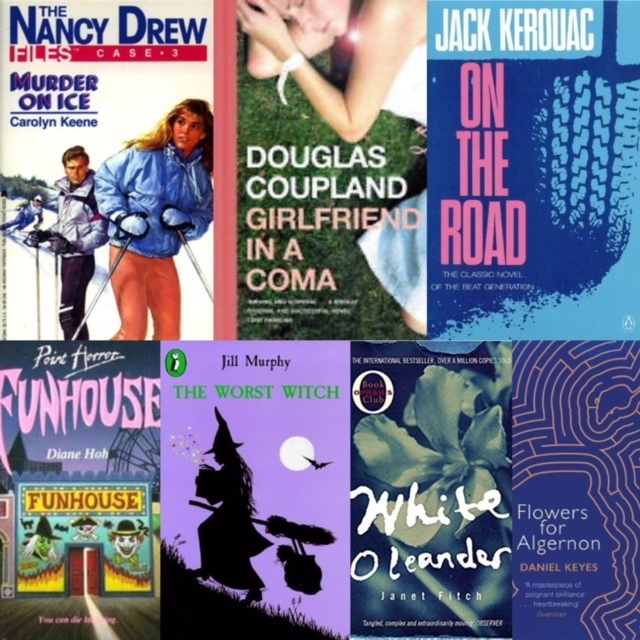 ), and post a montage of 7 books which were significant to me in some way, together in the one day. This blog post is going to give you an explanation as to why I chose them. I’ve listed them in the order that I read them. The Nancy Drew Files – Murder on Ice by Carolyn Keene – I probably started reading The Nancy Drew Files, (a spin-off series of the originals), when I was about nine or ten. I remember stocking up on these during visits to my local library. Nancy Drew always found herself at the centre of mystery and danger. Her life always seemed so exciting and grown-up, and I remember enjoying the fact she was a headstrong character. A massive influence clearly on my present writing where I love placing teenagers at the centre of mysteries that they are determined to solve, no matter what danger they may encounter along the way. Point Horror – Funhouse by Diane Hoh – I was about ten or eleven when I first started to read the Point Horror books. Funhouse is just one of many stories within this series that I devoured. Around this time I couldn’t get enough American teen fiction (think Sweet Valley High and the Babysitters Club). What I loved about Point Horror was the darkness and mystery, and again this has clearly influenced my writing. This particular book is set at an amusement park on The Boardwalk in California and it starts with the Devil’s Elbow roller coaster going off its track, which the protagonist soon discovers was no accident. If I picked this up in a bookshop today I would definitely still want to read it! Lastly I had to mention Douglas Coupland as I devoured his books in my twenties. I chose Girlfriend in a Coma as it was the first of his books I read. I love his observational style, and the comments he makes about society in subtle ways through his characters and plot. Often people ask me who my favourite author is and I struggle, because I like to read vast and wide, and I tend to have favourite books, not authors. But at one point during my twenties I would have a confident answer to that question: DC And I got to meet him one year at the Edinburgh Book Festival. Total fan girl moment. 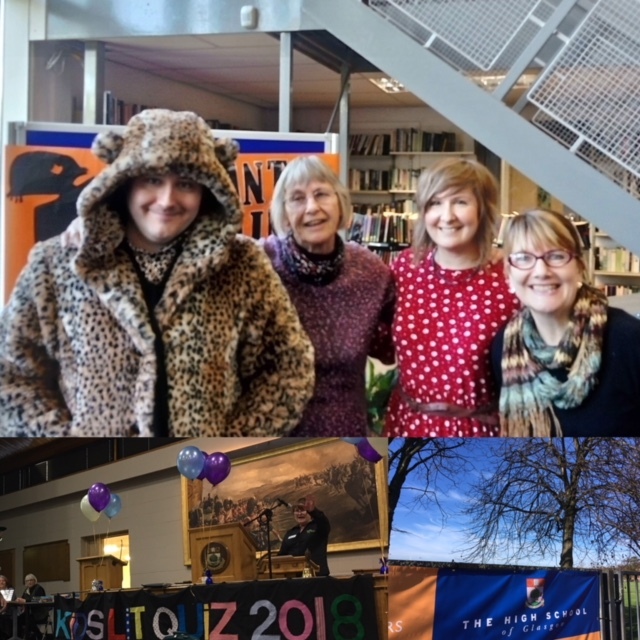 I spent today taking part in the Kids’ Lit Quiz, at the High School of Glasgow, on the author team with Kirkland Ciconne, Annemarie Allan and Alex Nye. The Kids’ Lit quiz is an annual literature quiz where teams of students (ranging from the age of 10-13) from all across the world, answer literary questions. Quiz master, Wayne, comes up with some pretty hard questions. I took part in this quiz a couple of years back and what struck me again today was how amazing the kids are at answering the questions! They really know their literature and that is brilliant to see. They must be avid readers to know the answers to the very wide-ranging questions. I was asked a question a few weeks ago if I think kids still enjoy reading these days, with so much focus on computer games and other digital activities. All I know is that I have been lucky enough to visit many schools where kids (of all ages), still show a lot of passion and enthusiasm for books. They might not shout about it, choosing instead to read quietly in a corner. Writing this post reminded me how big a part books have always played in my life and the power that words can have to transport you and your imagination into worlds you could only ever dream of. 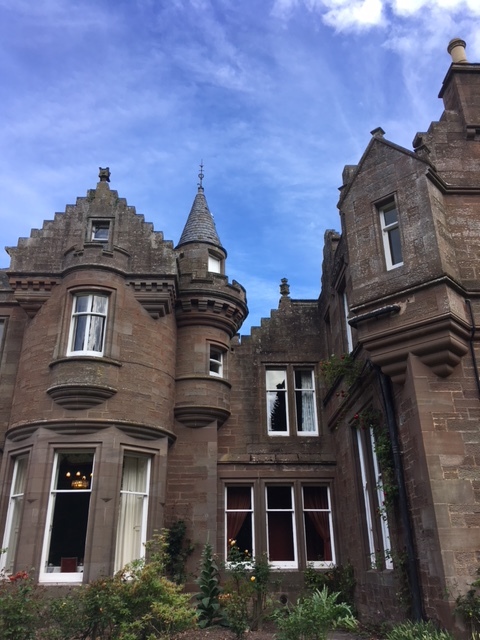 At the end of June I spent a fabulous weekend at the quirky Rosely Country House Hotel on a Chasing Time writing retreat. The theme for this particular retreat was ‘Stop the Clock’, with the emphasis on taking ‘time out’ to write. 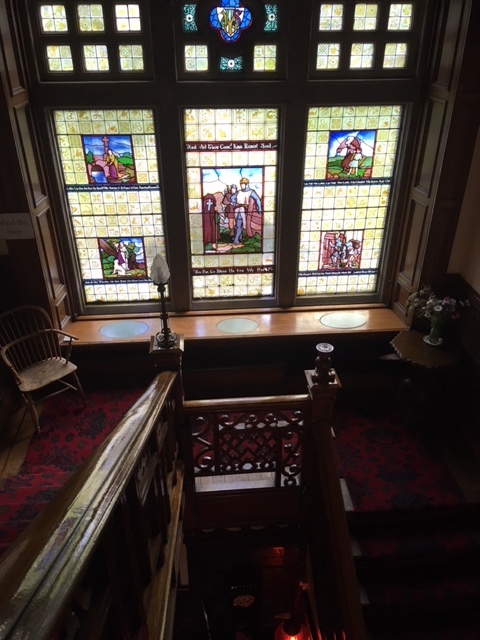 As soon as I arrived at this gothic mansion, which dates back to the 1800s, I could feel my imagination wake up. Writers Dawn, Elizabeth and Sandra were wonderful hosts throughout the retreat, delivering stimulating and creative workshops. Between workshops we were able to wander around the grounds of the hotel, and used the gardens as inspiration for one of our ‘writing sprints’. 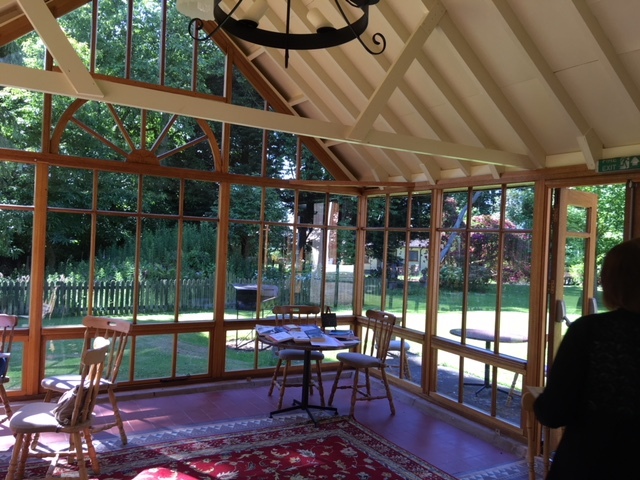 I loved that our hosts set up a little ‘library’ in the massive conservatory, with a table filled with books about writing and creativity, that we were all able to dip in and out of throughout our stay. I started to read Elizabeth Gilbert’s ‘Big Magic’ and it was perfect timing for me as a lot of the sentiments in this tied in with my last blog post about taking time out to daydream and ‘create’, as well as acknowledging the fear and doubts that can creep in when you try to write. 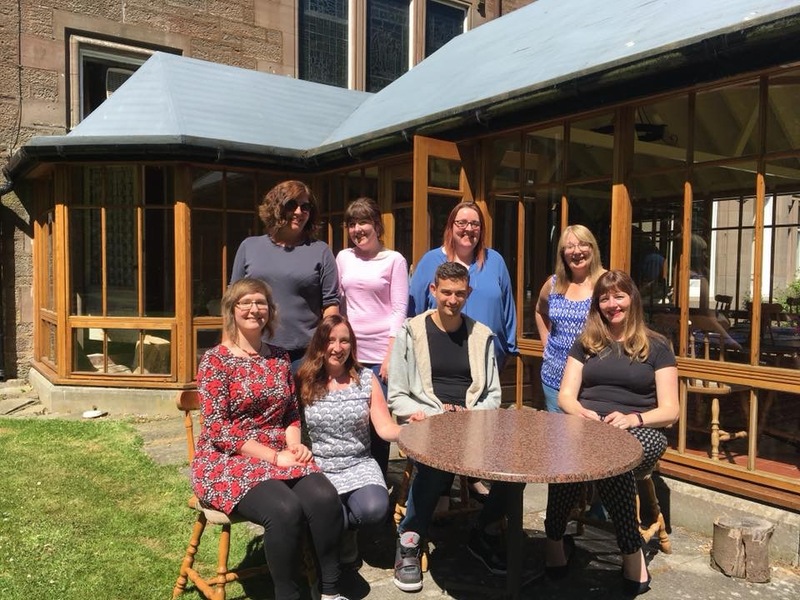 I loved meeting the other writers on the retreat – we were all at different stages of our writing careers, with different focuses and styles, but at the heart of every conversation was a passion and enthusiasm for words and creating stories. There’s nothing better than being able to switch off from the ‘real world’ for a while and talk about writing and books. On my first morning at the retreat I woke up very early, with scenes from my new book tumbling through my mind. I used the free writing time on the Saturday afternoon to map out the first eight chapters (a kind of meticulous planning that I never do! ), as well as writing extensive notes about characters. Since returning home I have made a good start on this book and I am so glad I took the time out on this weekend to kick-start the creation. There was a real sense of calm and quiet in the house. There’s something about old buildings which I find peaceful, perhaps because there is none of the ‘buzz’ of modern appliances. It’s rumored that there are a few ghosts hanging about Rosely. I am almost certain these ghosts were writers, joining in the fun on the retreat by weaving some creative magic into my dreams. At the end of April I took a couple of days off for my birthday which coincided with what I’m tempted to refer to as the start of summer, but let’s call it a surprise balmy Spring, which allows room for summer still to arrive. When it’s sunny outside I get the guilt, (I suspect it’s a Scottish one), where I feel the need to go OUTSIDE as much as possible to top up my tan and Vitamin D deficiency. This can make it difficult to write as a part of my brain switches off in the sun, and craves to read instead. 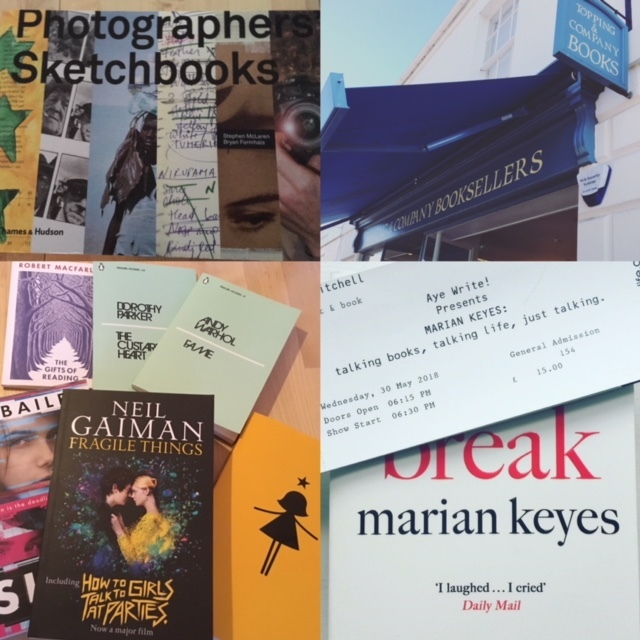 And then I remind myself that an important part of my creative process is to give myself permission to read, (and my montage of book photos is just a selection of ones I was gifted during April and May, from other people, as well as myself). My partner treated us to a night away in Anstruther, a beautiful coastal town, where we went for long walks and took our books to the beach, (I’m grateful that he’s an avid reader also, and lets me talk aloud when I’m musing about plot-lines in my own books). My time-out from real life allowed me to stop for a while and daydream. Finding time to daydream in a world which wants to keep us constantly switched ‘on’, but not always truly connected is a big challenge. I always have a to-do list swimming around my head, with WRITE SOMETHING flashing at the top, but often tumbling to the bottom to be buried underneath other every-day ‘priorities’. A big part of letting it fall away is allowing self-doubt to creep in, or to allow my practical brain to shout louder than the dreamer in me. Over the past couple of months I’ve made the time to go out and listen to other people talk about their dreams and creative journeys. Hearing other writers talk about how they started on their journey, and the dips and turns they took along the way, always inspires me to keep going and to keep dreaming, and to be brave – there is an element of just going for it when you’re engaging in anything creative, or starting something new. 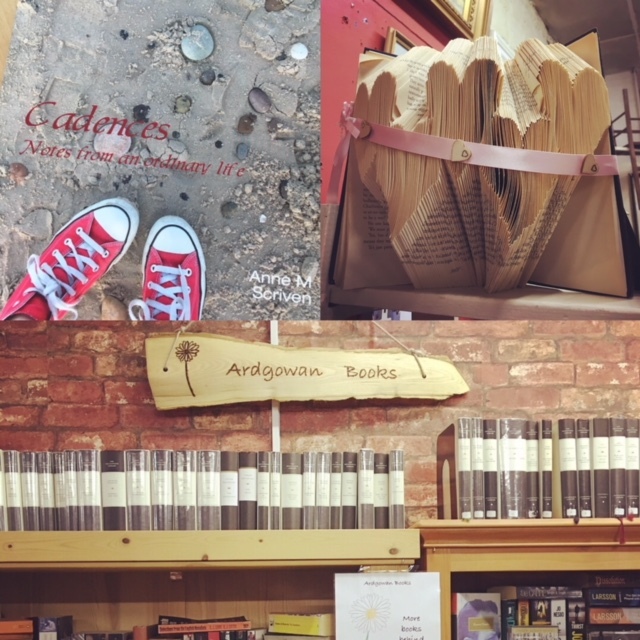 I recently visited local writer Anne M. Scriven at her new bookstall, Ardgowan Books, (click to view the website), which is housed within Randall’s Antiques at the ‘Barras’ in Glasgow. It’s a wonderful little sanctuary of books and Anne has such a passion for words, (and people), that it was a pleasure to see her exciting new venture and purchase her memoir, Cadences. A friend alerted me to the fact that Marian Keyes was speaking at an Aye Write add-on event at the Mitchell Library a couple of weeks ago. This was one of the best author talks I’ve been to. Marian was so entertaining and hilarious, but I was most moved by her honesty about the struggles she has faced in her life. What really struck me was the way writing called to her, and ultimately saved her. She described reading a short story in a magazine and wondering if this was something she could try, with a voice inside asking her to stay around, if only to give this a go. 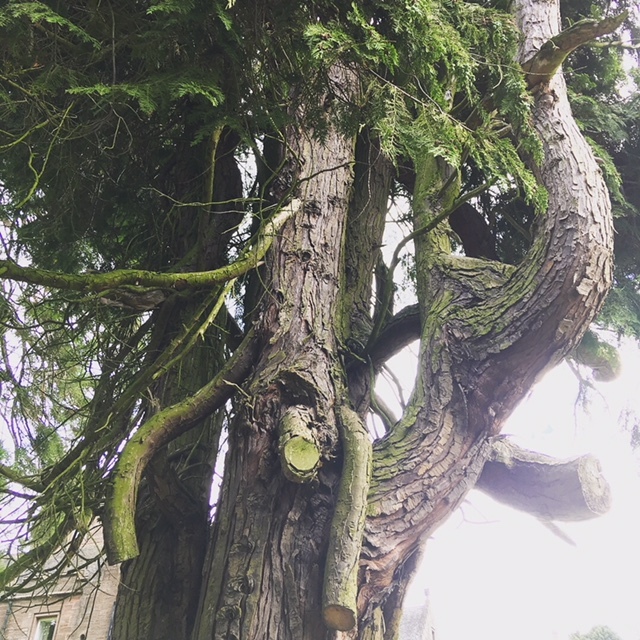 I think we’ve all got that voice inside us, that part of our creative self who is shouting, trying to make us listen, to ask us to just give it a go, and to give us permission to make time for ‘play’, to daydream and wonder, no matter what form that takes for you – it doesn’t have to be getting lost in words. I think some form of creativity, freedom of expression or play, whatever you want to call it, is so important to keep us sane in this world of responsibilities, and expectations and roles and rules. I’m looking forward to escaping reality for a while next weekend at the Chasing Time writing retreat, aptly billed, Stop the Clock. I can’t wait to take some time out to WRITE. In my day job as a careers adviser we have been learning about the future world of work, a feeling that we are moving into the 4th Industrial Revolution, (Industry 4.0). Experts predict young people of the future will need ‘meta-skills’ such as creativity, empathy, innovation, and the ability to collaborate. If we allow more time for exploration, for play, and space for experimenting with ideas and making mistakes, then perhaps more people would dare to dream and create something wonderful.